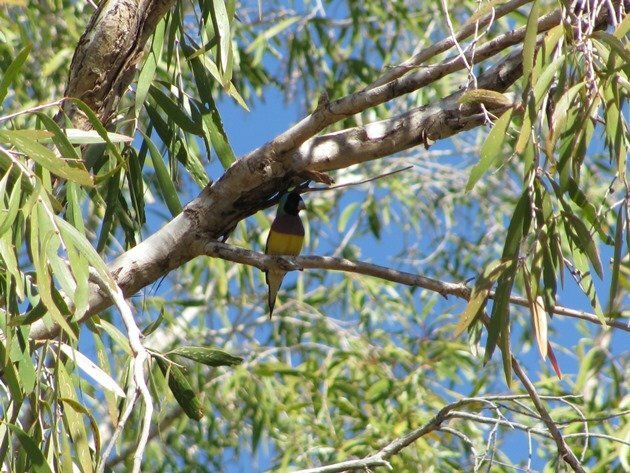 Before we left home to go camping and birding in the northern area of the Kimberley we had a plan that once we got as far north as the Northern Territory we would return to Halls Creek, Western Australia, via the Duncan Road. 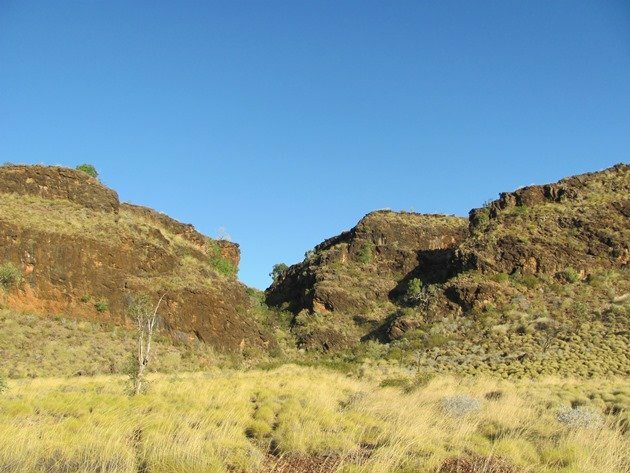 Our trip out to Wolfe Creek Crater had not been a planned side-track, but we had done some research on the Duncan Road before we set off. The Duncan Road was originally built between 1950 and 1956 to aid the cattle industry with transport, but it has since been decommissioned and it is now designated a “local road”. It was very hard to find recent information on the state of the gravel road and for this reason alone I will write this now and expand on various locations along the Duncan Road in future weeks. This route was travelled from July 6th over several days and gives you an indication on what to expect of this road over coming weeks. 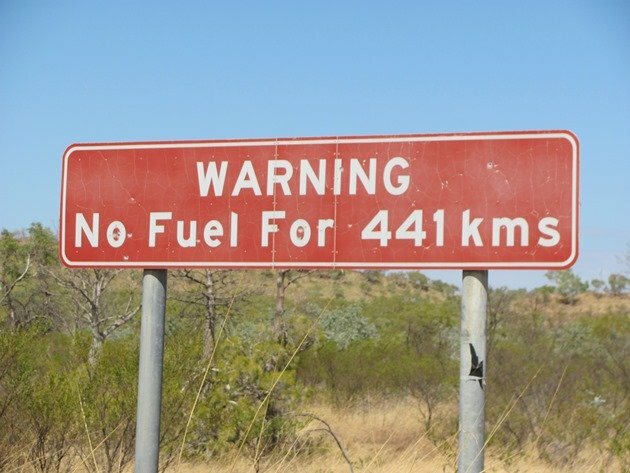 The Duncan Road runs from approximately 60 kilometres east of Kununurra and you need to make sure you have plenty of fuel before you head out of town and cross the border. We had read an article online that indicated it was a very poor quality road and tried to find out more information. 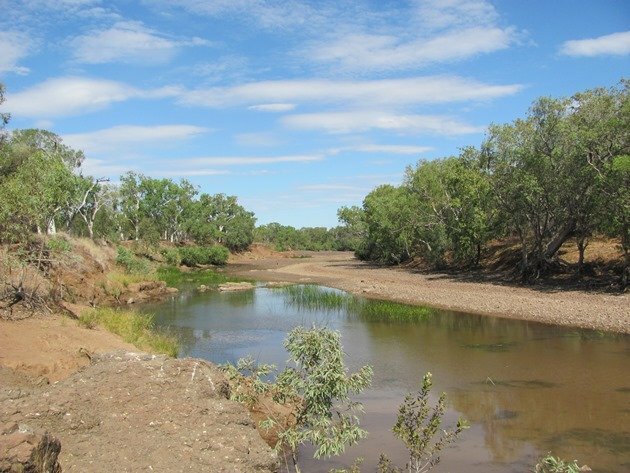 We had inquired at Halls Creek about the condition of the Duncan Road going north and they could only tell us that it was “open to all traffic” and not whether there was any water over the road. 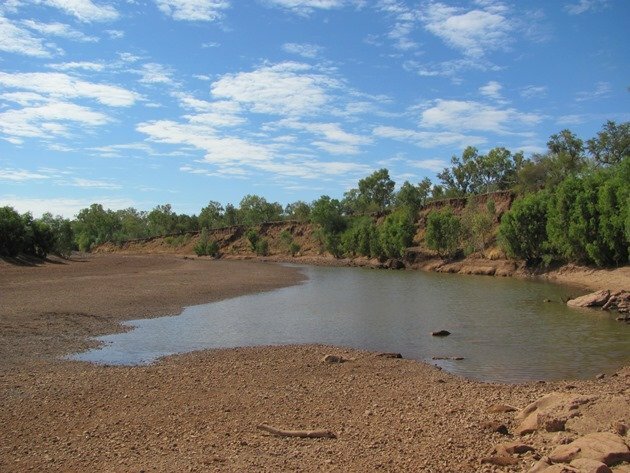 We then inquired in Kununurra about the condition of the Duncan Road going south to be also told that it was “open to all traffic” and that they believed that to mean that the water levels would not require a snorkel on your vehicle, but they had no idea of the depth of the water. They also believed it would not be too deep after a dry Wet Season. 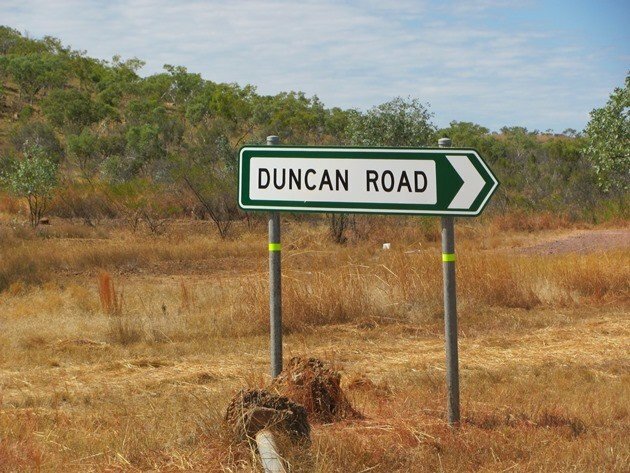 The problem with the Duncan Road is that it runs from the Northern Territory to Western Australia and back over the border into the Northern Territory and finally back into Western Australia. 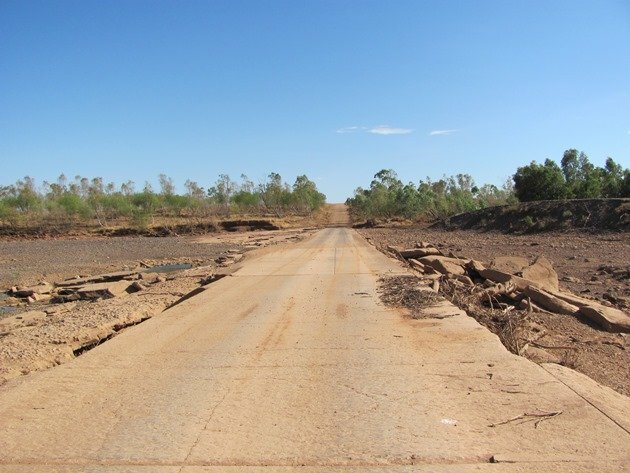 The road is maintained partly by the Shire of Wyndham and partly by the Shire of Halls Creek and there was even mention that some of it may be maintained by the Northern Territory, but they don’t have any mention of it on their road condition website! Rain can be unpredictable as to where it lands and so you can never be certain, but we had plenty of supplies and it should be made clear that there are NO FACILITIES at all along the length of the Duncan Road. In fact there’s a good chance that when you reach the second sign you have no phone reception anyway! We had expected the gravel road to be rough and slow going and the main reason was the number of flood-ways, dips and general rocky nature of that part of the country. It was not unpleasantly rough or slow and we knew that at the northern end of the road there would be places that should contain water where we could stop. The first stop was 16 kilometres down the road at Hicks Creek. 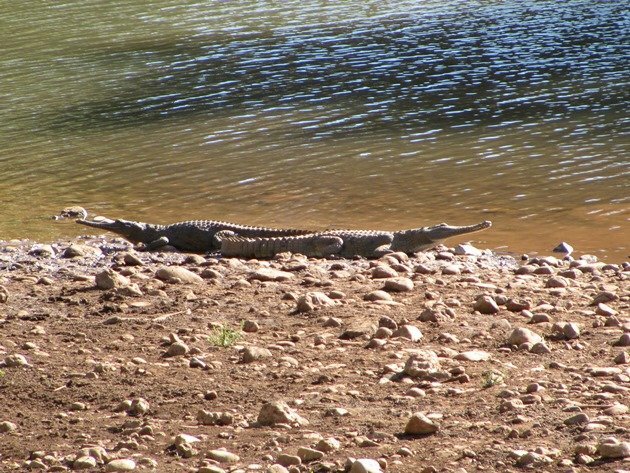 The waterbody was not huge, but it contained freshwater crocodiles and a variety of bird-life in the area. There was no water over the road at all, but there was plenty of dust and this continued for the length of the Duncan Road. 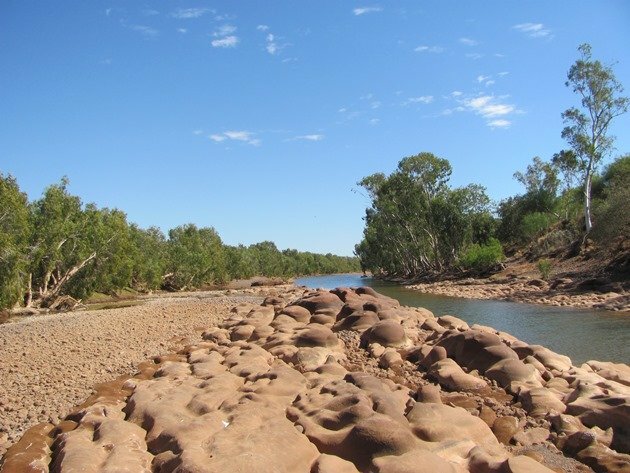 The next body of water was at the Behn River, a further 47 kilometres down the Duncan Road and over some rough terrain. 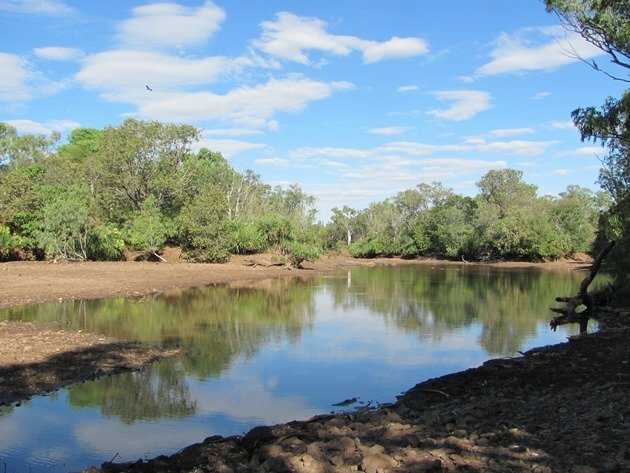 We were surprised to find it was not flowing at all, but still held enough water to maintain a decent number of freshwater crocodiles and a wide variety of birdlife. Even these small pools of water can produce some surprising birds and we were lucky enough to encounter a Black Bittern. I will expand more on the birding at the Behn River in a future post, but it is worth stopping and exploring! 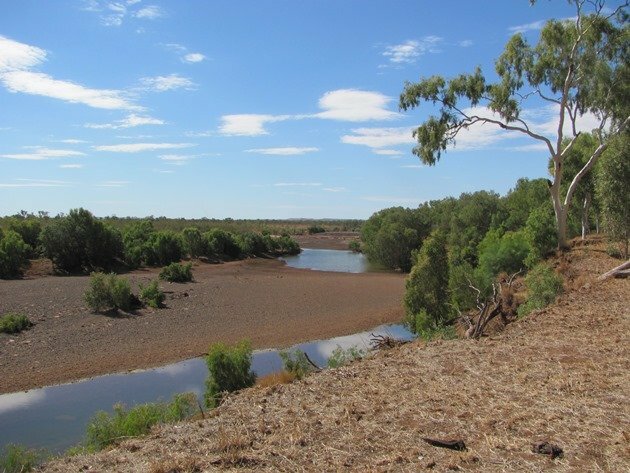 The next major water-body is the Negri River and it is a further 70 kilometres along the Duncan Road. The gravel road is slow going, but there was no water over the road at all and it was just very dusty. The Negri River would be a very wide river when it is flowing across the causeway, but in early July this year it is only just flowing and not over the causeway. 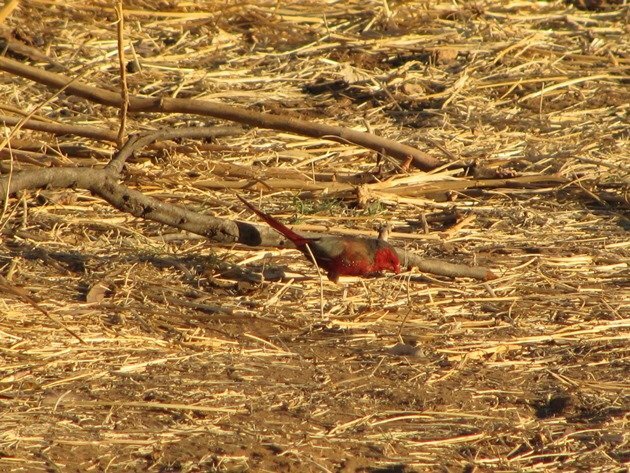 In fact the lack of water can be particularly good for bird-watching, because the birds all have to come to the remaining water. 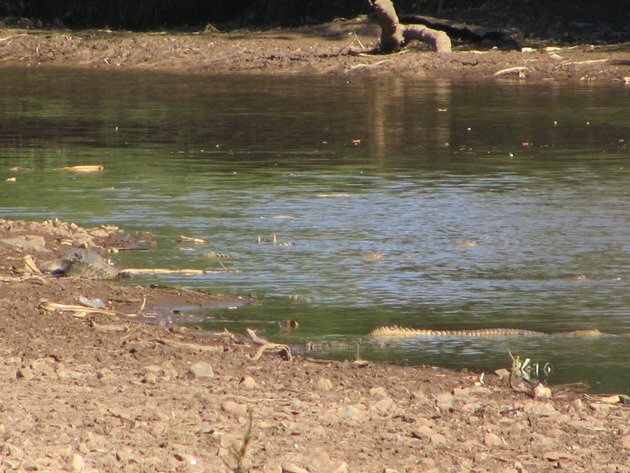 It also means that the freshwater crocodiles are concentrated too and there were some that were over two and a half metres long! We did not go for a swim! I will expand a lot more on the birdlife at the Negri River in future posts, but it was an excellent place to stop and explore along the river. 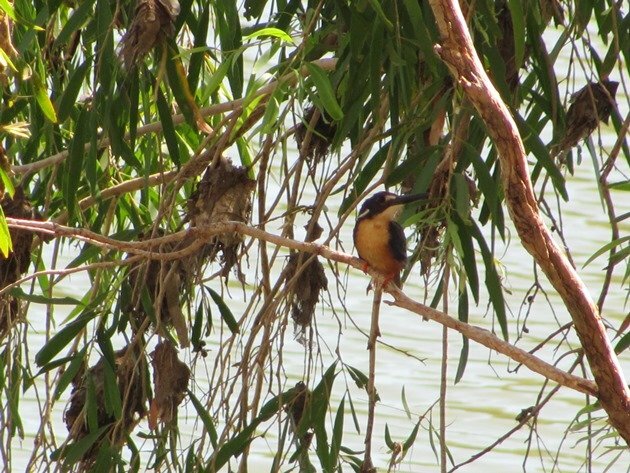 Azure Kingfishers that had been seen, but not photographed at the Behn River were more cooperative at the Negri River and they were our 300th bird of the year! There were dozens of Crimson Finch as we pulled up on the grassy edges and further exploration found the very rare and beautiful Gouldian Finch. Azure Kingfisher-300th bird for 2015! Continuing on from the Negri River the road improves and gets wider and across open plains. There are some very bad areas of bulldust that do have warning signs for them and there are some areas that are not as easy for the relevant Shires to maintain, but this is not a road that you should expect to be like a main highway. One of the main attractions for us was the fact that we could not find out a lot about the road meant there was a good chance that nobody was travelling it! In fact this is perfectly true! We had the road almost completely to ourselves other than a couple of station vehicles and a couple of other four-wheel drives on the last day. 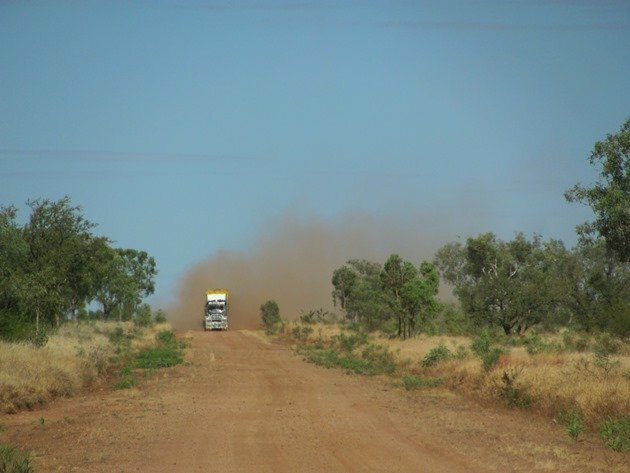 At this time of year there are cattle being transported along the Duncan Road and due to the size of the cattle trucks being over 50 metres long and due to the extreme dust it is advisable to just get off the main track completely and wait for the dust to settle. You will know there is traffic approaching for a long time before you see it due to the dust! 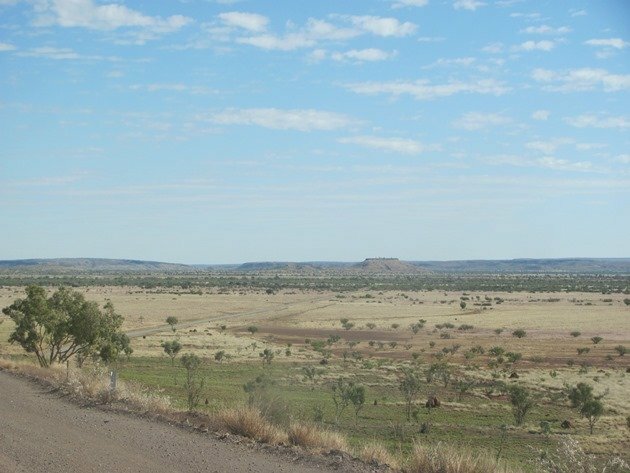 The gravel road is very wide and of good condition from the turn-off near Nicholson Station homestead towards Halls Creek until you reach the windy road through the range about 70 kilometres from Halls Creek. 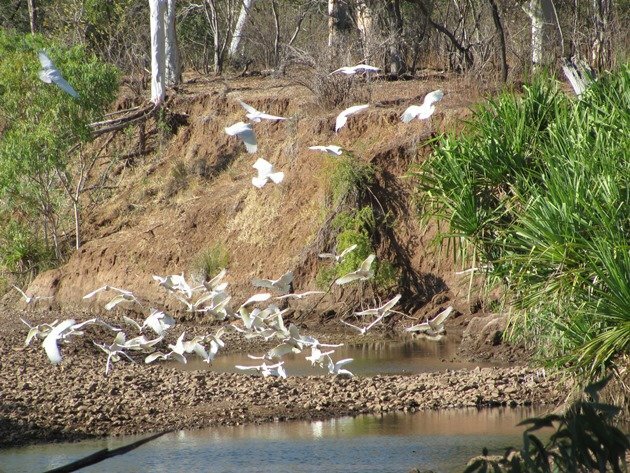 There are no major water-bodies after the Negri River, but small pools remain at the occasional flood-way and are worth stopping for, because you may encounter Brolga. The road climbs up offering good views of the surrounding area and then you enter the range. Once you enter the range it is slow going due to the road being very windy and rough, but it is a pleasant and picturesque drive. Sawpit Gorge offers spectacular scenery and fresh water and then following on from there you have Palm Springs, which is a popular spot for people to visit. 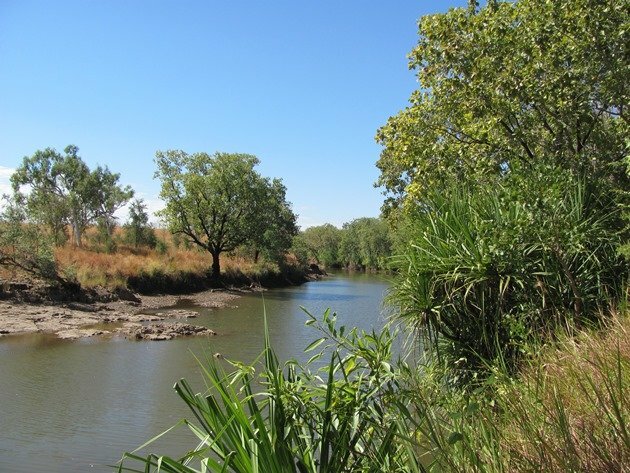 The Duncan Road was particularly enjoyable with the huge variety of birdlife that it offered around the waterbodies and there is no doubt that depending on how much rain falls during the Wet Season that it would be completely different each and every year. It is not a road to be travelled fast along, but a road to enjoy the varied scenery and the real outback. As always, it is important to be well prepared for any situation and to be completely self-sufficient. I will expand further on the other birdlife in future weeks. 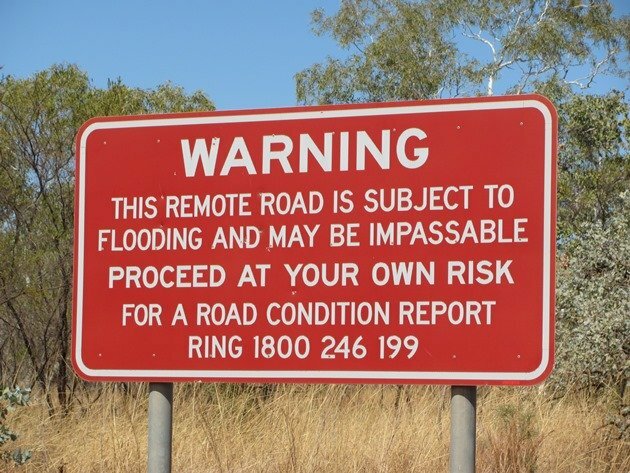 Our beatwriter, Duncan, really should go and explore this remote road next time he makes it to Australia! Goulding Finches, nice. Managed to get an Azure Kingfisher in Sydney last week. Johanna-I have added a map link at the top and it starts at 16 03 33.43 south: 129 05 27.90 east and ends at 18 13 22.69 south: 127 40 12.50 east. I hope that helps you follow the gravel road on Google Earth. What amazing landscapes. The Crimson and Gouldian Finches are stunning! Any place that has no fuel for 440 km is bound to be amazing. Greetings from Heidelberg, with 1400 people/ km².